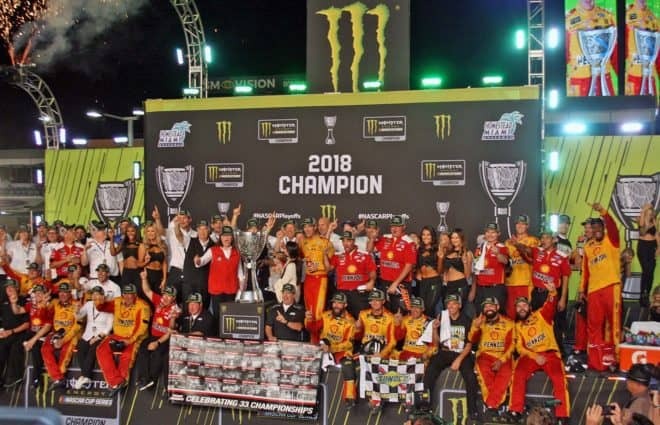 When it was all said and done at Homestead-Miami Speedway, it was Joey Logano holding up the 2018 Monster Energy NASCAR Cup Series championship trophy. 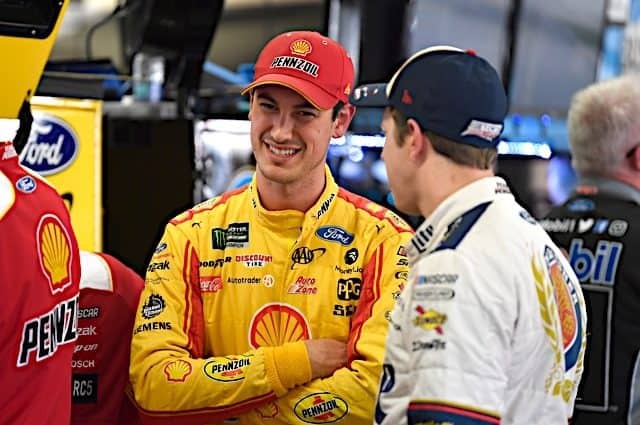 Logano was the least decorated of the four finalists but was running as well as anyone when the final four races of the season took place. Unlike several of the previous winner-take-all events, Logano was the best car in the finale. Martin Truex Jr. was strong over the long run but, as is often the case in Cup racing, a late caution popped up. Logano and crew chief Todd Gordon’s setup emphasizing a short run won him the race. As for the season as a whole, it was Kyle Busch and Kevin Harvick who won the most races. Stewart-Haas Racing was, by far, the most dominant organization with 12 wins among four drivers. All four of the teams at SHR won at least once, a first as Ford won its first manufacturer’s title since 2002. William Byron was awarded MENCS Rookie of the Year thanks to his point finish ahead of Darrell Wallace Jr. The season opened with Austin Dillon putting the No. 3 in Victory Lane at Daytona, 20 years after it previously parked there after Dale Earnhardt’s lone Daytona 500 win. Harvick then went on a tear and won the next three races in a row. Truex broke his string at California for his first win of the season. Clint Bowyer then became the second SHR winner of the season with a victory at Martinsville. 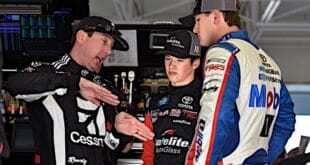 But Bowyer’s triumph would be an anomaly as the sport’s Big Three of Harvick, Truex and Kyle Busch flexed their muscle. It began at Texas, where Kyle Busch stepped up over the next three races and became the second driver with a three-peat. 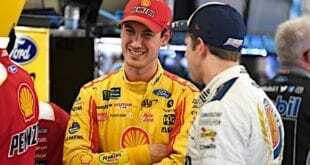 Logano broke Busch’s streak at Talladega followed by two more wins for Harvick. Kyle Busch fought back, a win at Charlotte giving him a win at every track on the circuit currently on the schedule. (At least, until the series went to the ROVAL in the fall). Truex, Bowyer, Truex and Busch were the next four winners to close out the first half of the season followed by a first-time winner. Erik Jones was the first to the checkered flag at Daytona, putting his No. 20 Joe Gibbs Racing ride in Victory Lane for the first time in the post-Matt Kenseth era. Truex put on another clinic at Kentucky before Harvick moved Kyle Busch late at Loudon. Busch responded by spanking the competition at Pocono. The Big Three probably were at their peak at this point in midsummer. The second road course of the season at Watkins Glen saw the first victory of Chase Elliott’s career and the second win by a Chevrolet all season. Harvick managed a win at Michigan for the second time in his career before Kurt Busch captured the old magic at Bristol to become the third driver to win for SHR. As the regular season wound down, it was Brad Keselowski who managed to set another NASCAR record. He won three straight at Darlington, Indianapolis and the first race of the playoffs in Las Vegas. It was the first time in history three drivers have each won three consecutive races in one season. 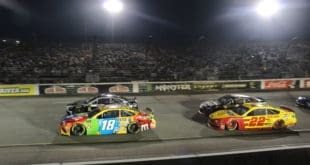 Kyle Busch won the second race of the playoffs at Richmond before Ryan Blaney advanced to the second round of the playoffs with a win at the inaugural ROVAL race at Charlotte. Jimmie Johnson spun out in the final lap of that race, trying to wrest the win from Truex. He would be among those failing to advance and wound up winless on the year along with Denny Hamlin. 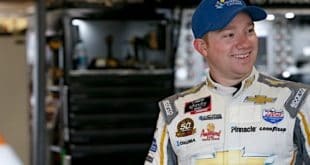 The second round of the playoffs saw Elliott win his second race at Dover, rebounding from a disappointing race there last fall. Aric Almirola then won at Talladega and became the fourth driver for SHR to win in 2018. He was followed with Elliott winning his third and Chevrolet’s final race of the season at Kansas. 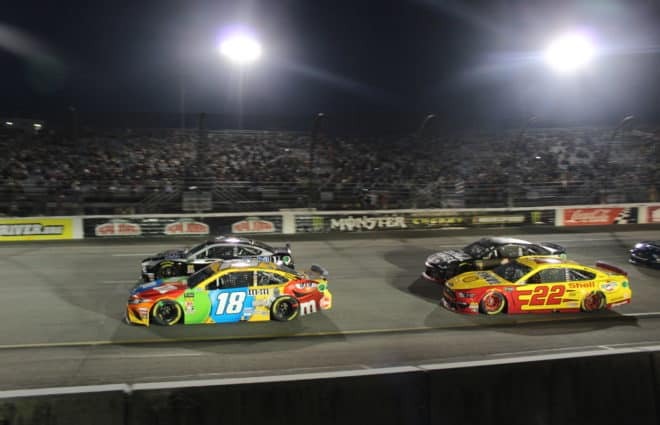 The third round of the playoffs began with Logano taking the win at Martinsville and locking in for the finals. Harvick then killed the competition at Texas but was found to have an unapproved spoiler. He had to forfeit his ticket to Homestead but would wind up advancing anyway. Kyle Busch won at Phoenix, the final victory for the sport’s Big Three on the year (20 in total). He and Logano were joined by Harvick and Truex, both of whom pointed their way in. It was an entertaining year where regular season success was rewarded in the playoffs but a hot team was able to overcome and win the title. A talent that was touted for years as a can’t miss finally didn’t miss. While some of the old guard remained on top, young talent in the sport broke into Victory Lane. Going forward, the sport is about to transition to a new crop of drivers but the older ones aren’t just going to lay down for them. Johnson and Hamlin both had won at least one race every year since they came into the sport. In Johnson’s case, it had been at least two races every full season. Neither driver won a race. Next year, they will both have a new crew chief atop their pit box. For Johnson, it is the end of his 17-year run with Chad Knaus. Hamlin loses Mike Wheeler, who earlier in his career was declared as his last crew chief. We’ll see how things play out next year. Keselowski is a team player and he’ll never speak badly about the success of his teammates and organization. But he has to be upset about not even making the final eight. Keselowski was on fire coming into the playoffs with three consecutive wins and what seemed to be some newfound speed. Unfortunately for Keselowski, his teammate seemed to grab that speed and run with it. The No. 2 team struggled at the worst possible time and didn’t even have a shot at getting to Homestead. Expect to see Keselowski back in 2019 and more focused than ever. He said it after Homestead-Miami and meant it: Harvick is happy with this season. The No. 4 was the fastest car at the track for well over half of the races. They were the standard by which everyone was measured. In the end, he didn’t win the title and that is the ultimate goal for everyone. But one of the best seasons in years has to leave a halfway decent taste in his mouth. The same is true for Kyle Busch. The ultimate win-or-nothing driver, Busch obviously was not happy after Homestead. But, when he looks back and sees he tied his career best in wins for a season (eight), he’ll crack a smile. Busch was the only driver to win a race in two playoff rounds before the final. He was also in the lead for the final restart of the season, giving his team a shot at the championship. There are many years left in his career and 2019 is going to be the year of the great 200 debate for Busch. Why? He’ll likely surpass Petty’s victory total in NASCAR’s top three series. It wasn’t a classic season, it wasn’t a storybook ending, but it was an entertaining year of racing. The teams have figured out the aero package and it will be changed for 2019. We’ll see a lot of very close racing next season thanks reduced horsepower on intermediate tracks. For this year, we’ll raise a frosty mug, or more accurately three, of Miller High Life to celebrate Logano’s first Cup title. You have a few months of no NASCAR racing but that doesn’t mean there is no racing available. You have the Snowball Derby, The Rumble in Fort Wayne, The Chili Bowl, Indoor Midgets in Atlantic City and much more to keep your racing appetite under control. As for me, this will be my last Thinkin’ Out Loud, at least on a regular basis. I have done this column for five years and it is time for a change of pace. Thanks to Matt McLaughlin for passing the torch to me; I hope I’ve done him proud. Whomever takes over for me will offer a new and different perspective that will stir your imagination and passion, week-in and week-out. I also want to thank all of you who read this column every week. It is the most read column on the website and I cannot express my gratitude for your support for the last half of a decade. 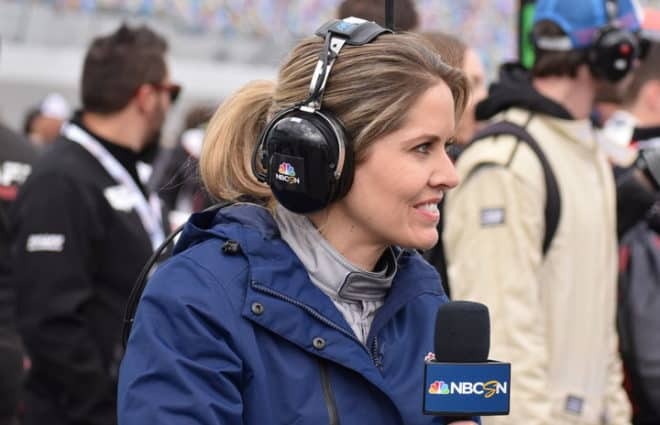 I am not going anywhere; I’m just going to be doing something different for Frontstretch. Please join our Patreon page and check out some new and different content we’ll be offering in 2019 and beyond. I’ll be at the forefront with new audio and a new, improved Tech Talk podcast that will offer additional insight into the sport we all love. Have thoroughly enjoyed your recaps! Great job; you will be missed! 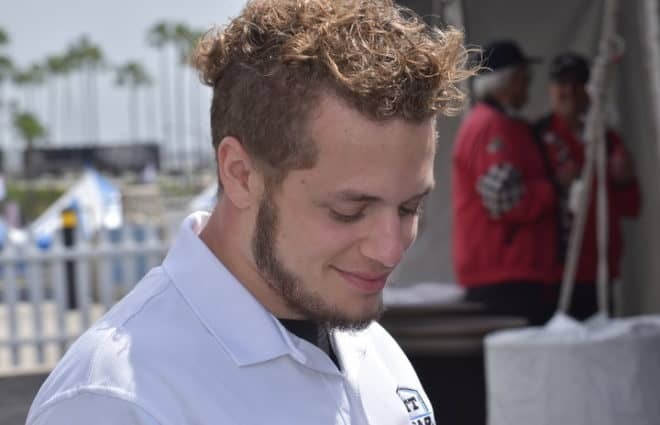 Thank you for a great job on these race recaps. I read them every Monday at lunch time – whether I watched the race or not. I was nervous of the author change 5 years ago, and I’m nervous about this one. But who are we kidding, I’ll read them anyway! One can only hope the craft brewery references remain. Looking forward to more great content from the FS.com team. It’s hard to believe you have been writing Thinkin’ Out Loud for 5 years now. As stated above, I also go to your column first thing Monday morning. Thank you for your excellent recaps. Good luck in the next phase at The Frontstretch! Hopefully your successor has the same amount of love for competition cautions. Thanks for all the reads Mike. You will be missed but I look forward to reading an article every now and then from you. All the best. Congratulations on a great five-year run, Mike! I have enjoyed your perspective, not always agreed with you, and was educated none the less. Glad you are sticking with FS in some capacity and wish you all the best! Thanks for doing a great column as you had big shoes to fill! I hope whoever takes over does as good as a job as you two did and no PC BS. This is my Monday morning go to, frankly before the regular news. So I hope whoever it is does it worthy. To you 5 cold Heinekens, in a mug, in a bar with NACAR friends. Great job Mike, you will be missed. All I ever needed to know about NASCAR was in your column. Good job Mike. I appreciate your weekly recaps. Thank you. I am sure whatever you do next year will be equally well done.